Other pages on this web site describe how PC is made and what is in it. Here, we will discuss what happens when it is mixed with water. 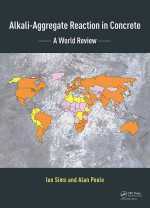 This page is a short introduction. 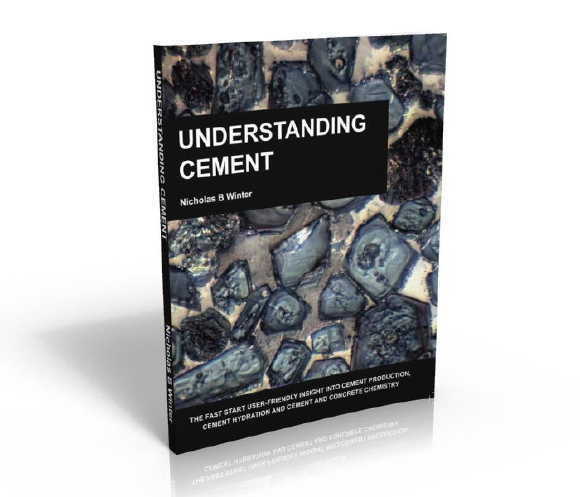 The Understanding Cement book/ebook contains a more detailed description of the hydration process and the hydration products. Clinker is anhydrous (without water) having come from a hot kiln. Cement powder is also anhydrous if we ignore the small amount of water in any gypsum added at the clinker grinding stage. The reaction with water is termed "hydration". This involves many different reactions, often occurring at the same time. 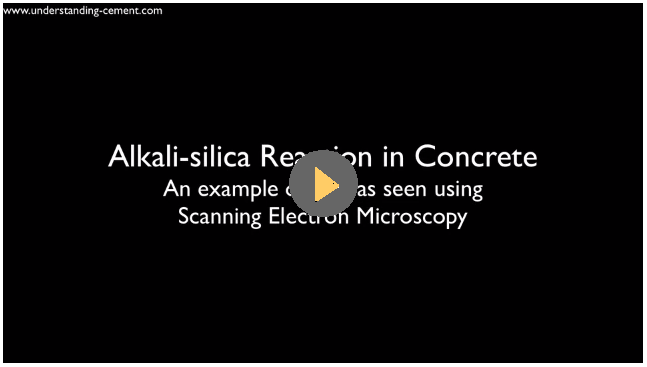 As the reactions proceed, the products of the hydration process gradually bond together the individual sand and gravel particles, and other components of the concrete, to form a solid mass. In the anhydrous state, four main types of minerals are normally present: alite, belite, aluminate (C3A) and a ferrite phase (C4AF). 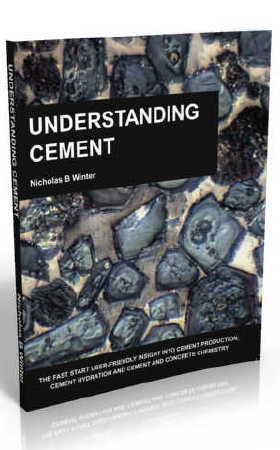 For more information on the composition of clinker, see the clinker pages. Also present are small amounts of clinker sulfate (sulfates of sodium, potassium and calcium) and also gypsum, which was added when the clinker was ground up to produce the familiar grey powder. When water is added, the reactions which occur are mostly exothermic, that is, the reactions generate heat. We can get an indication of the rate at which the minerals are reacting by monitoring the rate at which heat is evolved using a technique called conduction calorimetry. An illustrative example of the heat evolution curve produced is shown below. Almost immediately on adding water some of the clinker sulphates and gypsum dissolve producing an alkaline, sulfate-rich, solution. Soon after mixing, the (C3A) phase (the most reactive of the four main clinker minerals) reacts with the water to form an aluminate-rich gel (Stage I on the heat evolution curve above). The gel reacts with sulfate in solution to form small rod-like crystals of ettringite. (C3A) reaction is with water is strongly exothermic but does not last long, typically only a few minutes, and is followed by a period of a few hours of relatively low heat evolution. 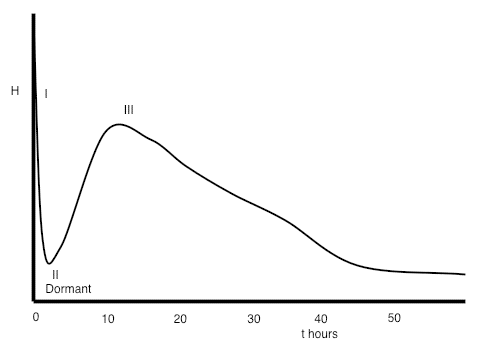 This is called the dormant, or induction period (Stage II). The first part of the dormant period, up to perhaps half-way through, corresponds to when concrete can be placed. As the dormant period progresses, the paste becomes too stiff to be workable. At the end of the dormant period, the alite and belite in the cement start to react, with the formation of calcium silicate hydrate and calcium hydroxide. 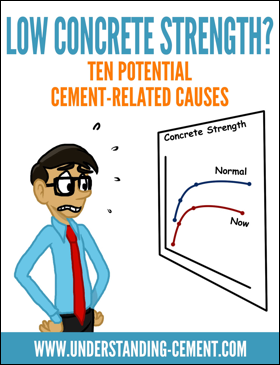 This corresponds to the main period of hydration (Stage III), during which time concrete strengths increase. The individual grains react from the surface inwards, and the anhydrous particles become smaller. (C3A) hydration also continues, as fresh crystals become accessible to water. The period of maximum heat evolution occurs typically between about 10 and 20 hours after mixing and then gradually tails off. In a mix containing PC only, most of the strength gain has occurred within about a month. Where PC has been partly-replaced by other materials, such as fly ash, strength growth may occur more slowly and continue for several months or even a year. Ferrite reaction also starts quickly as water is added, but then slows down, probably because a layer of iron hydroxide gel forms, coating the ferrite and acting as a barrier, preventing further reaction. Calcium silicate hydrate: this is the main reaction product and is the main source of concrete strength. It is often abbreviated, using cement chemists' notation, to "C-S-H," the dashes indicating that no strict ratio of SiO2 to CaO is inferred. The Si/Ca ratio is somewhat variable but typically approximately 0.45-0.50 in hydrated Portland cement but up to perhaps about 0.6 if slag or fly ash or microsilica is present, depending on the proportions. Calcium hydroxide: (or Portlandite)- Ca(OH)2, often abbreviated to 'CH.' 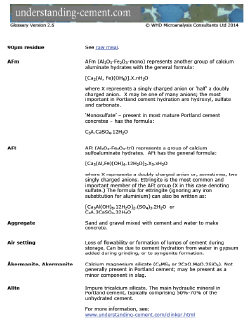 CH is formed mainly from alite hydration. Alite has a Ca:Si ratio of 3:1 and C-S-H has a Ca/Si ratio of approximately 2:1, so excess lime is available to produce CH. AFm and AFt phases: these are two groups of minerals that occur in cement, and elsewhere. One of the most common AFm phases in hydrated cement is monosulfate and by far the most common AFt phase is ettringite. The general definitions of these phases are somewhat technical, but for example, ettringite is an AFt phase because it contains three (t-tri) molecules of anhydrite when written as C3A.3CaSO4.32H2O and monosulfate is an AFm phase because it contains one (m-mono) molecule of anhydrite when written as C3A.CaSO4.12H2O. Ettringite: ettringite is present as rod-like crystals in the early stages of reaction or sometimes as massive growths filling pores or cracks in mature concrete or mortar. The chemical formula for ettringite is [Ca3Al(OH)6.12H2O]2.2H2O] or, mixing notations, C3A.3CaSO4.32H2O. Monosulfate: monosulfate tends to occur in the later stages of hydration, a day or two after mixing. The chemical formula for monosulfate is C3A.CaSO4.12H2O. Note that both ettringite and monosulfate are compounds of C3A, CaSO4 (anhydrite) and water, in different proportions. Monocarbonate: the presence of fine limestone, whether interground with the cement or present as fine limestone aggregate, is likely to produce monocarbonate (C3A.CaCO3.11H2O) as some of the limestone reacts with the cement pore fluid. Other AFm phases that may be present are hemicarbonate, hydroxy-AFm and Friedel's salt. 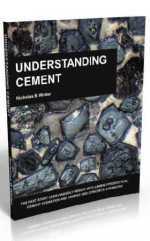 They contain a lot of water, especially AFt - principally ettringite in the context of cement. AFm contains a higher ratio of aluminium/calcium compared with AFt. The aluminium can be partly-replaced by iron in both AFm and AFt phases. The sulfate ion in monosulfate AFm phase can be replaced by other anions; a one-for-one substitution if the anion is doubly-charged (eg: carbonate, CO22-) or one-for-two if the substituent anion is singly-charged (eg: hydroxyl, OH- or chloride, Cl-). The sulfate in ettringite can be replaced by carbonate or, probably, partly replaced by two hydroxyl ions, although in practice neither of these is often observed. In a concrete made from cement containing only clinker and gypsum, ettringite forms early after the cement and water are mixed, but it is gradually replaced by monosulfate. This is because the ratio of available alumina to sulfate increases with continued cement hydration; on first contact with water, most of the sulfate is readily available to dissolve, but much of the C3A is contained inside cement grains with no initial access to water. Continued hydration gradually releases alumina and the proportion of ettringite decreases as that of monosulfate increases. If there is eventually more alumina than sulfate available, all the sulfate will be as monosulfate, with the additional alumina present as hydroxyl-substituted AFm phase (hydroxy-AFm). If there is a small excess of sulfate, the cement paste will contain a mixture of monosulfate and ettringite. With increasing available sulfate, there will be more ettringite and less monosulfate, and at even higher levels of sulfate there will be ettringite and gypsum. 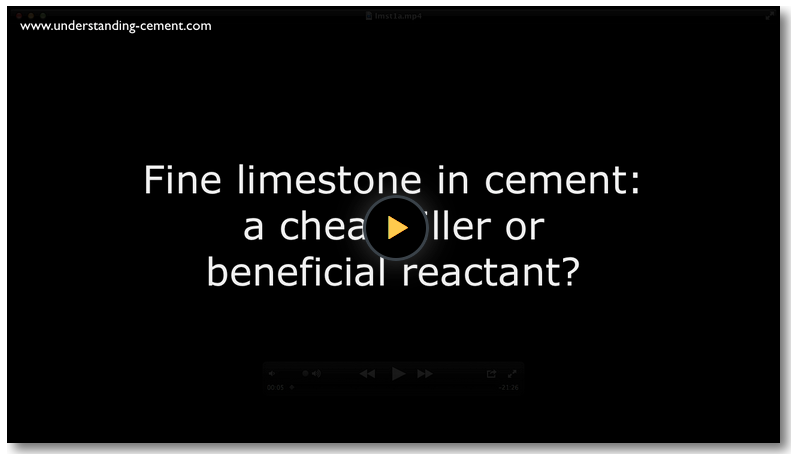 If fine limestone is present, carbonate ions become available as some of the limestone reacts. The carbonate displaces sulfate or hydroxyl in AFm; the proportion of monosulfate or hydroxy-AFm therefore decreases as the proportion of monocarbonate increases. The displaced sulfate typically combines with remaining monosulfate to form ettringite, but if any hydroxy-AFm is present, the sulfate will displace the hydroxyl ions to form more monosulfate. The key here is the balance between available alumina on the one hand, and carbonate and sulfate on the other. Hydrogarnet: hydrogarnet forms mainly as the result of ferrite or C3A hydration. Hydrogarnets have a range of compositions, of which C3AH6 is the most common phase forming from normal cement hydration and then only in small amounts. 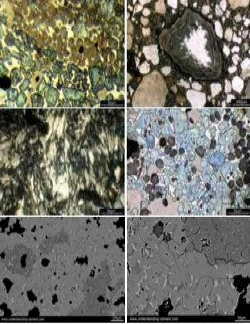 A wider range of hydrogarnet compositions can be found in autoclaved cement products.